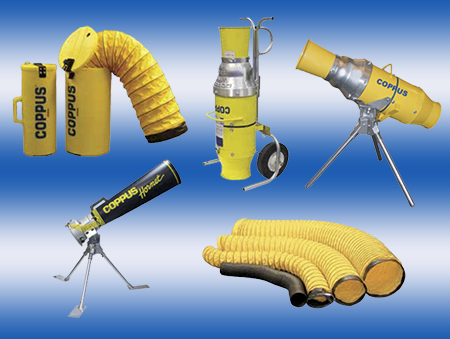 For nearly a century, COPPUS products have provided reliable portable ventilation for applications around the world. They are trusted in a variety of industries including: aerospace; chemical; defense; food and beverage; marine; mining and refinery; oil and gas; pharmaceutical; public utilities; and paper and pulp. 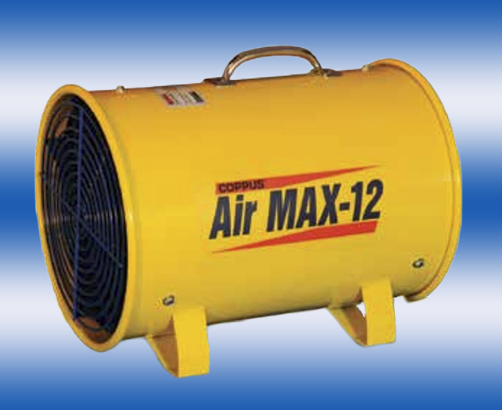 The COPPUS Air Max-12 is an economical, high-volume tube axial blower designed for ventilation and fresh air supply in confined spaces. It is made of 18 gauge, powder-coated steel, fixed guide vanes, and a glass-reinforced, polypropylene, non-sparking fan blade. 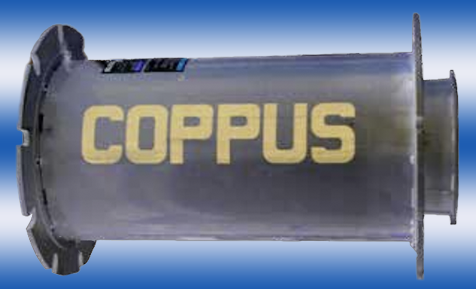 For more information, see the COPPUS Air Max 12 Datasheet launch. Check out our online stock to order directly or contact us to start your purchase order. 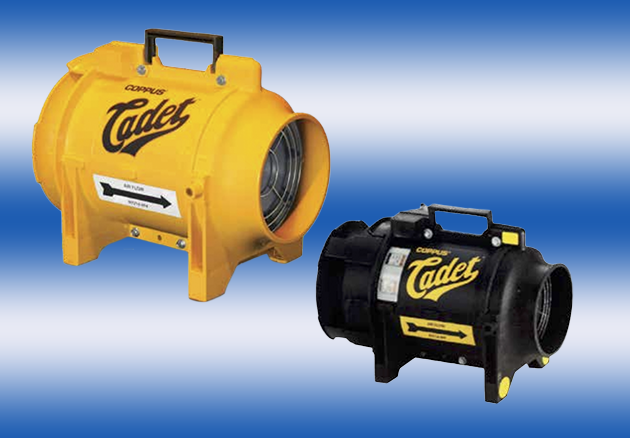 The COPPUS Cadet are compact, vane axial blowers that are ideal for utility underground and light manufacturing confined space ventilation. These units feature non-corrosive, injection-molded housings, fixed guide vanes, and a glass-reinforced, polyester resin, spark-resistant fan blade. For more information, see the COPPUS Cadet Datasheet launch and contact us to start your order. The COPPUS CP-20 is turbine-driven blower/exhauster used to degas, ventilate, or cool large process vessels such as furnaces, reactors, and tanks. It is made of cast aluminum housing and fan blade, stainless steel turbine buckets, and stainless steel nozzles for high or low pressure applications. For more information, see the COPPUS CP&dash;20 Datasheet launch and contact us to start your order. The DDHK is a powerful air mover suitable for personnel, product, and process cooling. The DDHK design allows for adjustable control of air flow from a gentle breeze to a concentrated blast depending on application needs. The unit can operate from either a four-wheel floor stand with locking casters or it can be mounted to a wall. The DDHK is available in 24 inch (610 mm) and 30 inch (762 mm) models. For more information, see the COPPUS Double-Duty Heat Killer Datasheet launch and contact us to start your order. The Jectair HP air horn employs a patented air mixing chamber and "Venturi" action from the nozzle to efficiently produce a large volume of air at a high velocity. For applications in which dissipation of static electricity is a concern, the Jectair Hornet HP diffuser is made of a lightweight, shock-resistant, conductive polymer that has a maximum operating temperature of 160°F (93°C). The Jectair HP is available in the following five sizes: 3S-HP, 3-HP, 6-HP, 8-HP, 9-HP. The Jectair Hornet HP is available in the following three sizes: 3S-HP, 3-HP, and 6-HP. For more information, see the COPPUS Jectair HP and Hornet HP Datasheet launch. Check out our online stock to order directly or contact us to start your purchase order. 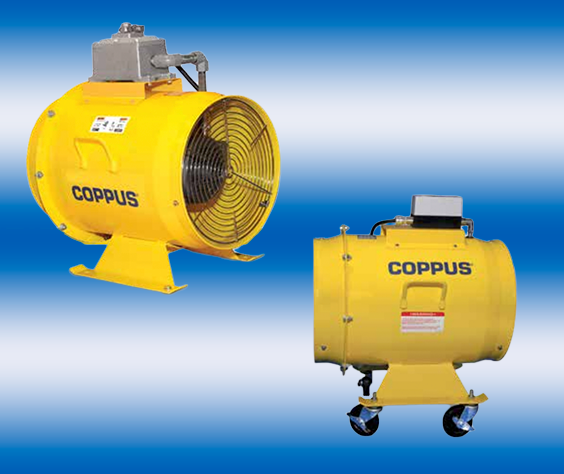 COPPUS offers steam/compressed-air turbine-drive ventilators and water turbine-drive ventilators in a variety of sizes. They are available in supply and exhaust models, and are ideal for drying and ventilation applications in the marine and shipping industry. 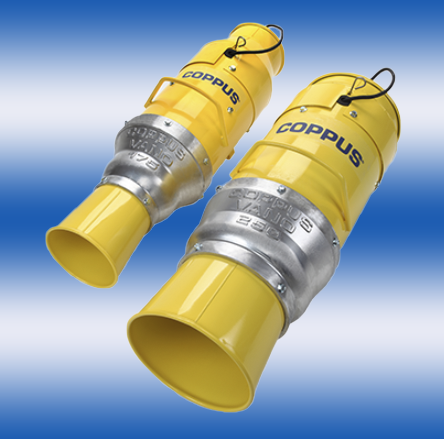 For more information, see the COPPUS Marine Ventilators Datasheet launch and contact us to start your order. 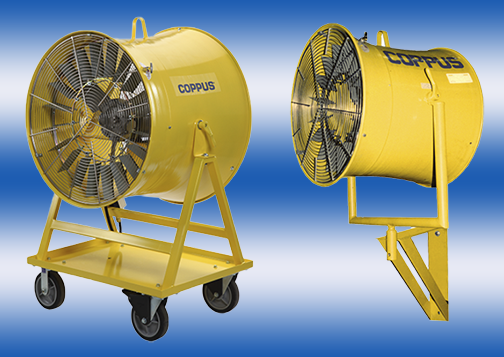 The COPPUS Marine Venturi is a lightweight, deck-mounted, compressed-air drive ventilator. It can be set up in either a supply configuration to deliver fresh air in confined, on-board spaces or in a exhaust configuration for degassing purposes. For more information, see the Marine Venturi Datasheet launch and contact us to start your order. 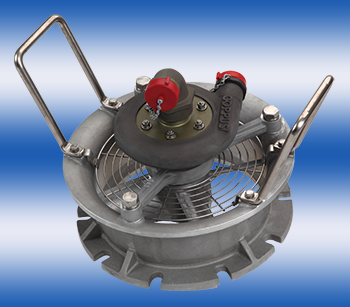 The Portavent is a centrifugal ventilator featuring a direct-drive 3,500 RPM fan motor and a unique, multi-position stand design to suit a variety of setup options. It is ideal for a variety of applications requiring fume removal, cooling, or ventilation of confined spaces. The Portavent is available in the following three models: PV-500, PV-750, and PV-1000. For more information, see the COPPUS Portavent Datasheet launch and contact us to start your order. 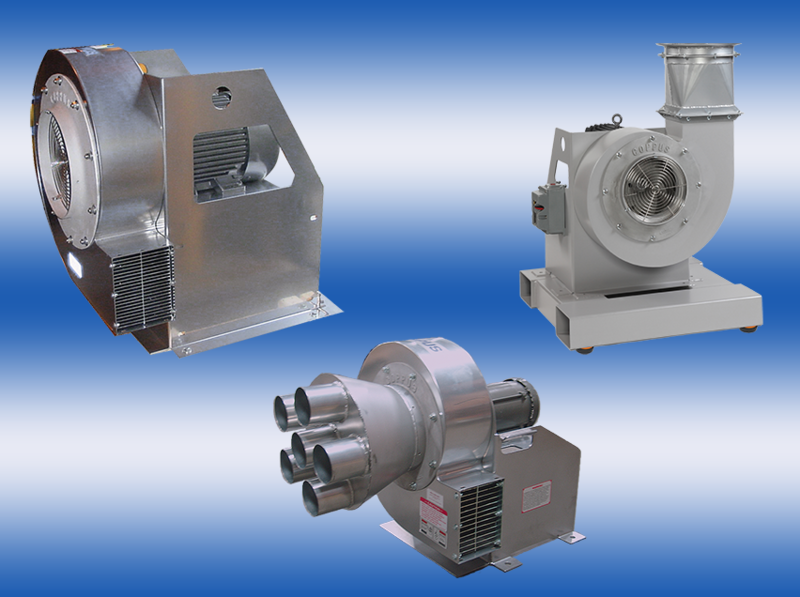 The COPPUS RF series offers four models (RF-12, RF-16, RF-20, RF-24) of air-driven reaction fans that are extremely efficient, provide high volume, and require low maintenance. They are ideal for applications with demanding ventilation requirements and in hazardous locations. Each model can function as a blower (for fresh air supply) or exhauster (for fume exhaust), and each comes in a variety of sizes to fit your specific needs. Their housing and fan blades are made of rugged, spark-resistant cast aluminum and their bearings are permanently lubricated. 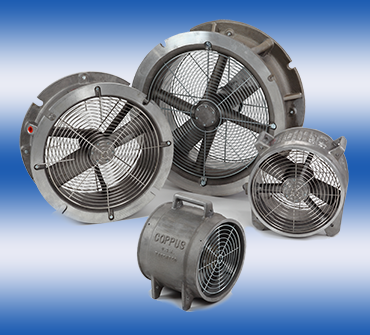 For more information, see the COPPUS Reaction Fans RF-12, RF-16, RF-20, RF-24 Datasheet launch and contact us to start your order. The COPPUS TA15 delivers a large volume of air together with high-static pressure capabilities. It is well suited for ventilation applications that include large tanks, tunnels, towers, and shipboard compartments as well as for product and process cooling applications. These units are made of powder-coated, heavy-gauge steel housings and cast-aluminum or glass-filled spark-resistant fan blades. For more information, see the COPPUS TA16 Datasheet launch and contact us to start your order. The COPPUS VANO series offers a fixed-guide vane design that is capable of delivering high volumes of air at a consistent static pressure. 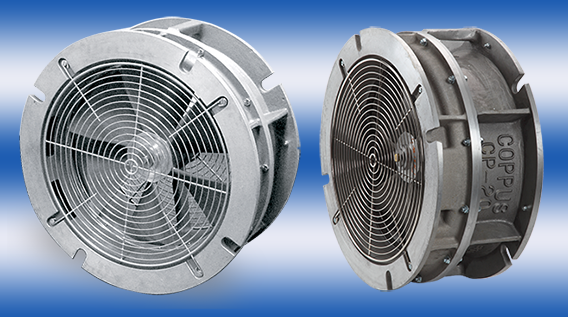 These ventilators are used to exhaust fumes and deliver fresh air in confined spaces such as tanks and manholes. The VANO is available in two models: 175CV and 250CV. For more information, see the COPPUS VANO 175CV and 250CV Datasheet launch and contact us to start your order. 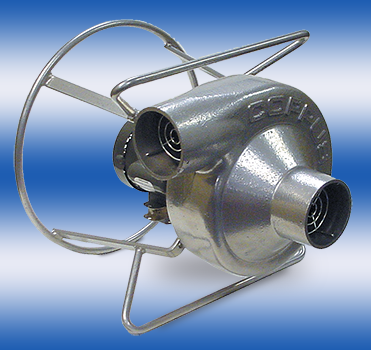 The Ventair is a high-pressure centrifugal blower/exhauster that is ideal for supplying fresh air or for capturing fumes for multiple remote locations (when using the optional multiple-inlet adapter). The Ventair is available in the following models: TM-4, TM-5, TM-6, TM-8, and TM-9. For more information, see the COPPUS VENTAIR® TM Datasheet launch and contact us to start your order. 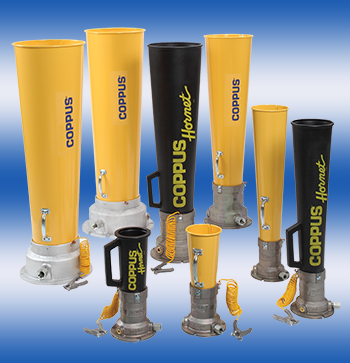 COPPUS offers a variety of accessories to complement their ventilation products including ducts, duct canisters, tripods, transport carts, and adapters. For more information about these accessories, see COPPUS Accessories launch and contact us to start your order.